A destructive and fast-moving wildfire erupted in northern California on Thursday morning, spreading rapidly due to a mix of howling winds and extremely dry conditions. The Camp Fire, in Butte County, north of the state's capital, Sacramento, had burned through some 18,000 acres as of Thursday evening and was zero percent contained as officials scrambled to evacuate area residents. Acting Gov. Gavin Newsom declared a state of emergency. Social media was flooded with apocalyptic imagery of smoke-filled skies and horizon lines of neon orange. Others took to Twitter to post messages about missing family members. 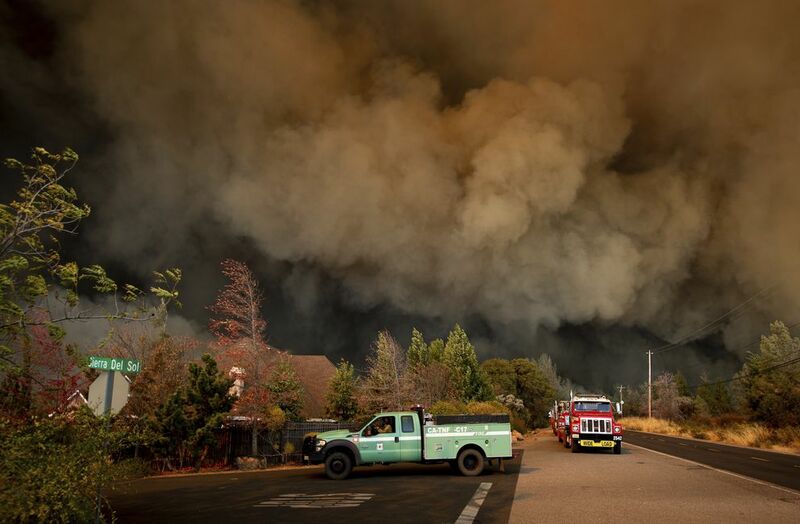 The town of Paradise, California, population 27,000, has been evacuated, officials told local news reporters, as were the nearby communities of Pulga and Concow. Colton Percifield, 20, said in an interview that he awoke at friend's house in Concow to find smoke outside around 7 a.m. Spot fires soon encroached on the house. "Within half an hour the whole place was in flames," he said. By 8:20 a.m., the house was burning. Percifield left in his pickup truck for an emergency meeting place in a field outside town, finding himself on an empty road with the fire a swelling inferno on both sides of the road around him. A video he took captures the hellacious conditions he described; thick smoke and heat surrounding the truck as the temperature rose inside, while giant sparks and flames licked the roof over his head in near pitch-black darkness. At one point, a tree branch fell on his car, smashing his windshield and denting his hood. Percifield said that he drove off the road a few times in the low visibility conditions but eventually made it to a meadow that is maintained for residents to gather in the event of fires. He said that people spoke there about neighbors in Concow who had been unable to escape their homes. According to Sacramento Bee reporter Ryan Lillis, some 60 to 70 people were awaiting an emergency evacuation at a Walgreen's in Paradise. "Fire crews asking for buses to get them out," he reported. The Adventist Health Feather River hospital in town caught fire, as firefighters battled the flames, Lillis wrote. The hostpital's parent company could not be reached for comment. Evacuation routes were clogged with people attempting to flee the growing blaze, the Sacramento Bee reported, and first responders expressed concern about whether they could escape. 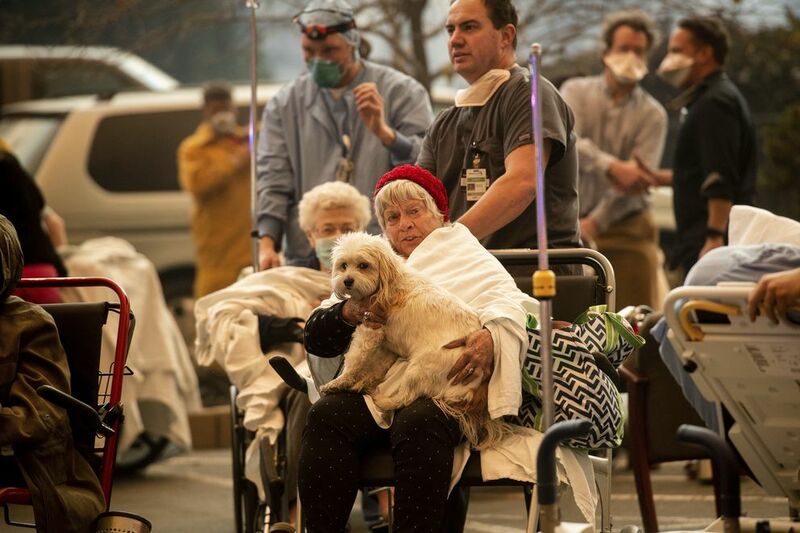 More than 20,000 people had been evacuated the San Francisco Chronicle reported. "Right now, Mother Nature is in charge," spokesman Bryce Bennett told the Bee. 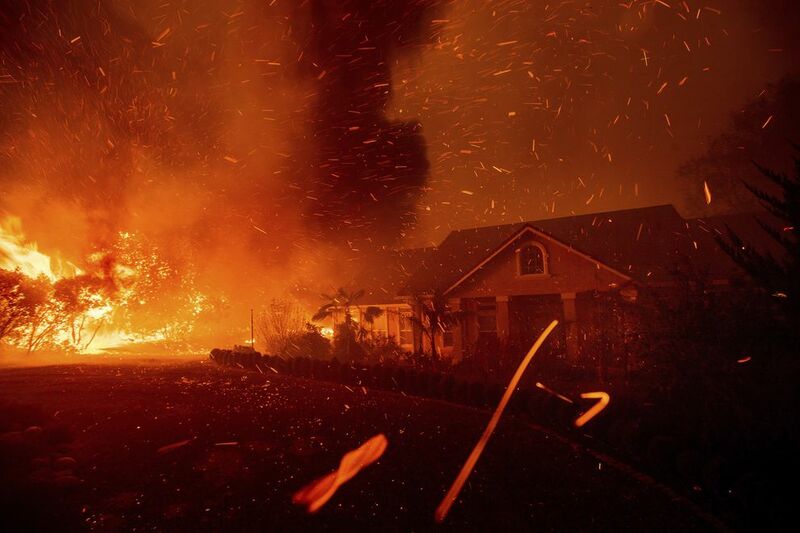 The National Weather Service had predicted dangerous fire weather conditions in California because of Santa Ana winds, which roar in from the east and accelerate down California's north-to-south-oriented mountain slopes. Red flag warnings for "critical fire weather conditions" were in effect not only for the Sacramento Valley but also through Central and Southern California. Wind gusts of 50 mph were expected in many locations. There were 23.4 million Californians under red flag warnings Thursday into early Friday, after which the winds should ease and give responders improving conditions for battling the blaze. California has experienced debilitating fires of unprecedented regularity in the past few years. In August, the Mendocino Complex fire became the largest wildfire ever recorded in the state, eventually burning more than 400,000 acres. The previous record had been set less than a year before in another catastrophic fire that burned through more than 280,000 acres in Ventura and Santa Barbara counties. In October 2017, some 21 wildfires burned nearly 95,000 acres and 7,000 buildings in Sonoma and Napa counties in the heart of California’s wine country, killing 40 people.